The Eurasian lynx, our largest wild cat, has been a new inhabitant of the Protected Landscape Area Moravian Karst at least since last September. It was directly observed and documented by the scientists from Mendel University in Brno Martin Duľa and Miroslav Kutal. It now appears that the lynx is permanently present in the Moravian Karst and the wider area of Drahany Highlands. The experts of Nature Conservation Agency (Administration of the Moravian Karst PLA), Mendel University in Brno, Institute of Vertebrate Biology at the Academy of Sciences and the volunteers of Friends of the Earth CZ confirmed its presence during the joint monitoring when they recorded the animal's tracks. The conclusive evidence came from the camera trap installed near the killed prey. During the monitoring, the scientists obtained samples of hair and faeces for genetic analysis which could reveal the origin of the animal. The nearest reproducing lynx population lives in the Beskydy Mountains and Javorníky, where last year and the year before five females with cubs were recorded. The largest Czech population is in the Bavarian Forest (southwest Bohemia) and the adjacent regions of Bavaria and Austria, where 60 - 80 adult lynx live. Lynx usually move and hunt across the area of several hundred square kilometres; the territory of the lynx in the Moravian Karst is thus likely to include the wider area of Drahany Highlands. The public is also helping with the monitoring. People are encouraged to report their observations to Friends of the Earth at e-mail stopy@selmy.cz. Lynx, like wolves, are gradually returning to many areas where they were extinct centuries ago. Zoologists, therefore, welcome any reports on large carnivores' presence which helps them to evaluate the current distribution and habitat needs of wolves, lynx, and bears. Increasing number of reports over the last few months is due to suitable conditions for snow tracking and the increasing number of people involved in monitoring. "We received the first reliable information about the presence of rare carnivore in the autumn but we could not be sure whether the animal only migrates through the area. However, it has been confirmed now that the lynx is staying here long-term, as evidenced by repeated observations, footprints and kill findings. From the conservation perspective, this is very good news. The occurrence of lynx indicates the quality of environment which offers the abundance of prey and hiding places. The presence of large carnivore so close to the South Moravian capital is no cause for concern. A lynx avoids people and it typically selects weaker prey. We ask drivers, however, to be cautious, especially in the evening and at night when the lynx are most active. A collision with a car can be fatal for a lynx. "The Eurasian lynx is a highly endangered species which demonstrates somewhat lower ability to colonize new areas than, for instance, a wolf. Credible information about its occurrence outside the area of its permanent presence in the Beskydy Mountains and the Bohemian Forest are therefore very valuable. The lynx in the Moravian Karst shows that the species can find suitable conditions for life in unexpected places. The crucial task is to protect the carnivore from poaching and heavy traffic." 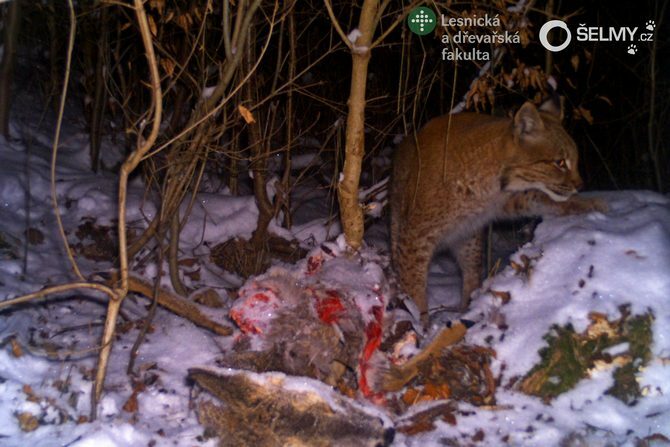 "Based on the monitoring of this individual, in which we are fully involved from the start, and our experience from the long-term monitoring of lynx along the Czech-Slovak border, we are able to say that the conditions in the Moravian Karst are more than suitable for the lynx and that it seems to be settling here. According to recent research, there is a kind of "trade off" between the availability of prey and natural hiding places. Abundant prey and rugged terrain are what this shy carnivore needs. Given the high level of urbanization, dense infrastructure and intensive human activity, we are going to continue monitoring the lynx as this can help us obtain valuable scientific data and support effective species conservation." "We were informed about the presence of lynx in the area of Moravian Karst and subsequently we have instructed our staff to monitor its movements (occurrence signs, remains of kill). Training Forest Enterprise of Mendel University Masaryk Forest in Křtiny supports the monitoring and research of this rare animal in cooperation with experts from the Faculty of Forestry and Wood Technology and the Administration of Moravian Karst PLA." The project TRANSGREEN (DTP1-187-3.1-TRANSGREEN) is co-funded by the European Union through the Interreg Danube Transnational Programme (DTP), Priority 3 - Better connected and energy responsible Danube region, Specific objective - Support environmentally-friendly and safe transport systems and balanced accessibility of urban and rural areas. Friends of the Earth are able to carry out projects on protection and monitoring of large carnivores thanks to generous support of individual donors – Friends of Large Carnivores. Please join us here. Supported by a grant from Switzerland through the Weiss Contribution to the enlarged European Union.